This one requires a bit of explaining. For my “Uncannonical X-Pals” campaign, at one point I wanted to use an X-Men villain named Apocalypse, a powerful psionic mutant from Ancient Egypt revivied in the Modern Era. Now, one of Apocalypse’s schticks was to recruit a team of four henchmen to be the “Four Horsemen of Apocalypse”. And naturally, these four would be named and modeled after the ones from the Book of Revelation. This bugged me, because Apocalypse was supposed to be an Ancient Egyptian, remember? From centuries before St. John ever heard of Patmos. But since my game was called “The Uncannonical X-Pals”, I felt no shame in altering continuity however I felt. 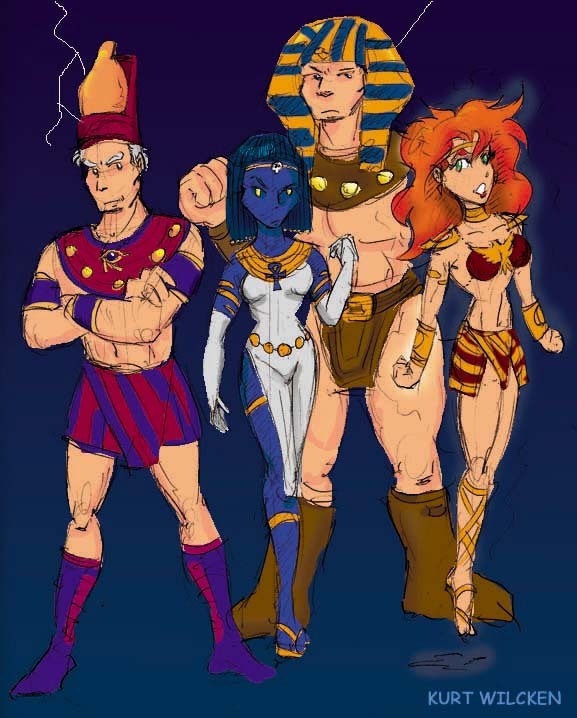 I gave my version of the Four Horsemen all Egyptian motifs to their costumes; and the characters I chose for his roster were some of the most powerful mutants in existance: Magneto, Mystique, Juggernaut (not technically a mutant, I know, but work with me), and (heh heh!) the Phoenix! Yeah, I decided if I was going to use Apocalypse, I was going to make him freakin’ scary.